“Time Should Be Up for Breast Cancer Too” print PSA features a powerful image highlighting the message that 1 in 8 women will be diagnosed with breast cancer and information on male breast cancer. 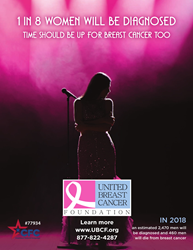 The United Breast Cancer Foundation (UBCF) is pleased to announce the publication of their print Public Service Announcement (PSA), “Time Should Be Up for Breast Cancer Too” published in the 60th Annual Grammy® Awards Commemorative Program. “Music’s Biggest Night,” The 60th Annual Grammy® Awards, will take place for the first time since 2003 at New York City’s Madison Square Garden on January 28, at 7:30 pm. The telecast will be broadcast live on CBS at 7:30–11 p.m. ET and 4:30–8 p.m. PT. The 60th Annual Grammy® Awards Commemorative Program will be available in both print and digital versions and is available for purchase at over 30,000 retail outlets nation-wide, including Target®. The official Grammy® Awards Program is music’s biggest collectible. It is available at all official Grammy® events, distributed complimentary to all attendees at the 60th Grammy® Awards, on the official Grammy® website, through the Grammy® Museum, and in the Recording Academy’s major chapter markets such as Atlanta, Chicago, Los Angeles, Memphis, Miami, Nashville, New York, Philadelphia, San Francisco, Seattle, Austin, and Washington, D.C.. An estimated total distribution is 1,238,995 with an estimated readership of 3.5 million. The “Time Should Be Up for Breast Cancer Too” print PSA features a powerful image of a solitary woman at a microphone under pink spotlights highlighting the message that 1 in 8 women will be diagnosed with breast cancer and information on male breast cancer. UBCF is committed to serving women and men impacted by breast cancer through seven life-supporting programs, including early detection services through the Breast Screening Program. UBCF wishes all Grammy® Award nominees the best of luck!